Ahmedabad University, Office Campus, Commerce Six Crossroads, Navrangpura, Ahmedabad. Please connect over WhatsApp/Call with Jatin (+91-9871154845). 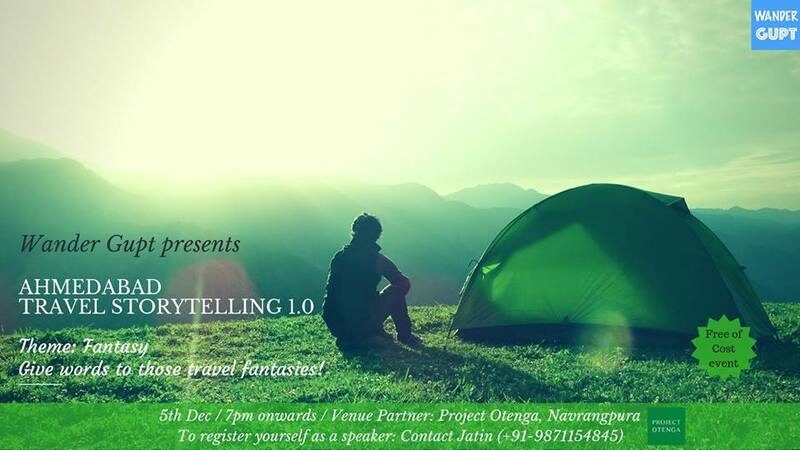 The theme for Wander Gupt’s first ever Travel Storytelling event is “Fantasy!”. Ever had those fantasies of “beach camping with the One”, or “first spotting of the Tiger” or “Northern lights” or “a bike ride in the Himalayas”? It is time for you to give words to those fantasies and share aloud how the trip you fancy in your dreams would transpire! Come and hear about the dreamy trips of others as well! In this give and take of the travel fantasies through storytelling, you shall unleash and discover the power of imagination, a certain sense of accomplishment of speaking your mind, realise the routes to bring those dreams to reality, make many new friends and learn about their dream trips, and so much more!